With what potentially looks like a loss of mission for Progress M-27M questions will once again arise as to the impact on re-supply to the International Space Station. At present the mission hasn’t been declared lost however the longer the vehicle spins out of control the more likely it is that they will not be able to recover it. The next attempt will not be until 8pm CDT today 4/28/2015 at which point the vehicle would have been out of control for 15+ hours. Typically the lost of one cargo vehicle doesn’t have an immediate impact on the operations of the station as they keep approximately 5-6 months of contingency supplies on-board. The biggest impact typically relates to any science that was carried on the vehicle, most will most likely be replaced in future missions but any on-going experiments that needed the supplies could be impacted more severely. However this isn’t the first cargo mission to be lost recently, last October the Cygnus spacecraft was destroyed on liftoff and it’s almost 5000 lbs of supplies were lost. With the supplies potential lose today there could be a bigger impact. In addition the Progress vehicle is currently the only one available that can supplement the station re-boost ability and was carrying fuel for that purpose. In addition the last of Europe’s ATV re-supply mission has already been completed. 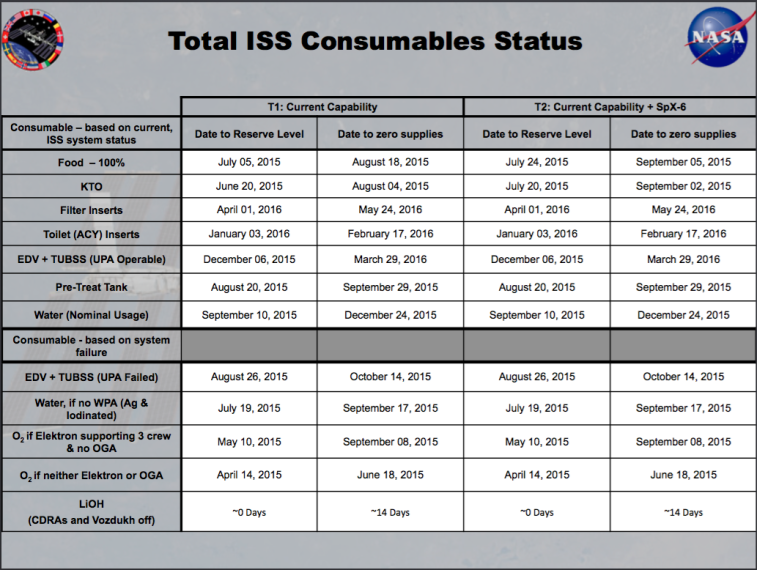 The chart below shows the current consumables available on the station after SpaceX CRS-6 delivery. The longer term impact will depend on how long it takes to determine the cause of today’s failure and what needs to be done to address it. At present it seems likely that future Progress launches will be delayed while they investigate. As are result there are currently only two vehicles available for cargo re-supply, SpaceX’s Dragon and Japan’s HTV.